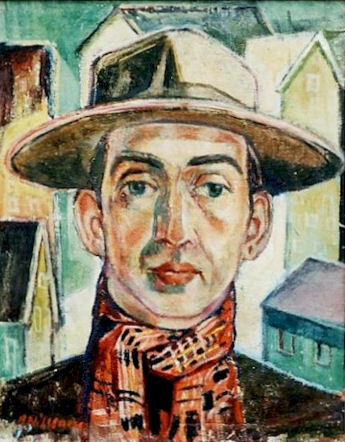 Arvid Nilsson was born in Torhamn , Blekinge 1914. He is the Blekinge artist who painted abstract, figurative and landscape in bold “personal colorite”. Arvid studied under Ivar Gustavsson in Karlskrona, under Otto Sköld at the Academy of Art in Stockholm and at Grand’Chaumiere et Collarossi in Paris. 1957 the family moved to Stockholm where Arvid was employed at the” AB Atom Energie”. His task was to study the plans of the engineers. Those technical plans he then transformed into perspective drawings. The task soon widens to include painting large murals in conference rooms and dining halls for AB Atom Energie, ASEA Atom, Gävle Hydroline AB mfl. During the 60ies Arvid developed his own oil painting style and technique. The 70ties was his most successful period in his artistic career..
Arvid had always a love for Blekinge, for its nature, its special coast and for its people. This he showed in his art; his colourful radiance in figures and nature that his special oil painting technique gave expression to. One can “feel” the austerity and structure of the rocks in several of his paintings. Arvid never excluded his social and general political engagement in his artistic work. Several, in general larger pictures, show this involvement. Style: decorative with a mixture of expressionism, abstraction and sometimes with a surrealistic touch. He was a good portrait painter.